Happy May! Our nearly famous pups can’t help but have fun celebrating May Day with their dance around the Maypole. Print and color then check out some of our related crafts for May Day and Mother’s Day. How many daisies are in the picture? 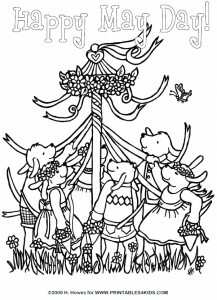 Click on the image above to view and print the Maypole coloring page full size or download the May Day Maypole Coloring Page as a PDF file. Visit our Mini Maypole Craft page for even more May Day fun.